The adjustable nature of the vehicle sleeve allows the tent to connect to the back of any SUV, minivan, crossover, wagon, Jeep Wrangler hard top, or pick-up truck with cap, WITH or WITHOUT a roof rack. Content: 20piece LED kit (10PCS Per group), double-sided tape. under cabinet led lighting or TV Backligth. Car & Truck Parts. Light Bulbs. IDEAL TUNING CAR, BOAT. 20X LIGHT STRIP. THERE ARE NO ISSUES THAT TWO INDIVIDUALS CANNOT RESOLVE. Truck Bed Mat Liners. Custom Designed / Precut Mat Liners Designed To Fit Each Application. Light Weight Anti-Slippery Mat Liner. • Protects Your Truck Bed From Scratches & Dents. • Instant Upgrade To The Bed Of Your Truck, Improve In Appearance & Styling. 30" LIGHT STRIP. Content: 20piece LED kit (10PCS Per group), double-sided tape. under cabinet led lighting or TV Backligth. For example In rare case, it can take up to 5-8 weeks. LETTERS BACKLIGHTIN. Westin Profile Floor Liners for vehicle front row protect the driver and passenger side floor areas from daily wear and tear. Their flexible durable and odorless rubber material maintains its shape in heat cold or from heavy loads. 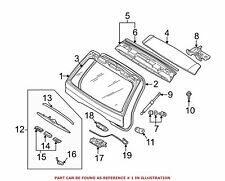 Part Number: DZ97904. Our mounting kits are designed specifically to secure any of our Crossover truck boxes and just like most of our rugged auto accessories, are made right here in the USA. Tool Box Tie Downs. Total 16 LEDs. 8 Pods x 2 LEDs Per Pod. Truck Bed LED Lights. - Serve As A Lighting Source For Working Outdoor On Your Truck Bed When It's Dark. 1 Watt LED. - Easy Installation, These Lights Can Either Mount Or Tape On To Anywhere With Screws Or 3M Tape. Good for any Ford GMC Chevy Dodge Nissan Honda Trucks. under cabinet led lighting or TV Backligth. Content: 20piece LED kit (10PCS Per group), double-sided tape. Super bright, Great for work lighting, or finding parcel quickly and safely. THE COMPLETE RGB TRUCK BED LIGHTING KIT features everything you need to make your ride stand out from the crowd! 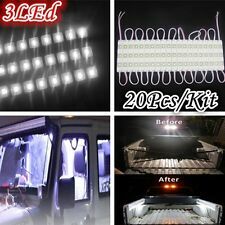 8PC RGB LED Truck Bed Lighting Kit includes two separate strands of 4 light pods with 9 LEDs per giving you a total of 8 pods and 72 ultra-bright SMD5050 LEDs. It is designed with 5730 SMD LED light source, which can provide 10W lighting power for your car or truck, even for indoor decoration lightening. Super bright- 60 pieces of 5730SMD beads produce 10W large power totally, which are suitable for either cars or cargo trucks’ interior lightening entirely. Waterproof: IP67 rated waterproof, snow-proof, dust-proof and sand-proof, silicone design protects this pickup led bed lights. 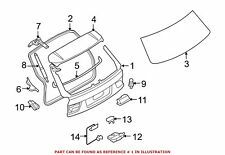 Application: Mount interior, exterior, truck bed, truck liner, wheel well etc; No instructions provided. BUY RISK FREE! LIKE NEW OPEN BOX! RETURNS ACCEPTED! Premium vehicles deserve premium accessories. That's why Lund brings light truck owners top-quality products that combine innovative, distinctive styling and rugged, year-after-year durability. From running boards to tonneaus, visors to wings, hood shields to cargo management, Lund's acclaimed accessories combine the variety and eye-catching good looks light truck enthusiasts need to make a great vehicle even better. Excellent compression set resistance for maximum service life and vibration absorption. Long-lasting automotive grade EPDM rubber is preferred by professional installers over PVC/foam seals..
GORGEOUS EFFECT & CAN BE MOUNTED ANYWHERE: Available in White, Icy Blue, RGB. - Light Color: RGB. - BRIGHT LUMINANCE: These truck bed strip lights are outfitted with efficient and economic LED. RV Awning Lights, Truck Bed Light Kit, Truck/Cargo Bed Lighting Light Kit, Running Board Led Light. GORGEOUS EFFECT& CAN BE MOUNTED ANYWHERE: Available in White, Icy Blue, RGB. It shines charmingly beautiful light when you light it. - Light Color: RGB. RV Awning Lights, Truck Bed Light Kit, Truck/Cargo Bed Lighting Light Kit, Running Board Led Light Kit, Step Bar Led Light Kit, Side Door Led. Excellent compression set resistance for maximum service life and vibration absorption. Long-lasting automotive grade EPDM rubber is preferred by professional installers over PVC/foam seals. No need to replace this seal every time your cap is removed. To determine if you need a Front Rail Seal measure the difference in height from the truck's side bed rails (including, if any, bed rail caps) to the truck's front bed rail. If the height of the front rail gap is .250" or less, just install one Extruded Solutions quality EPDM rubber truck cap seal to all 3 rails (see choices below). No need for a Front Rail Seal. .
UP FOR SALE IS A BMW E53 X5 4.6 4.4 3.0 BLACK DRIVER REAR SIDE WALL TRIM CARPET PANEL 7034365.